This road sign was recently erected in our county. Imagine you are driving north in traffic. You need to know if you should turn or keep going straight. Quickly what does this sign mean? East is still east and west is still west in my county, Here Ohio 15 runs north and south for the last 80 years, but that is not what the sign signifies. 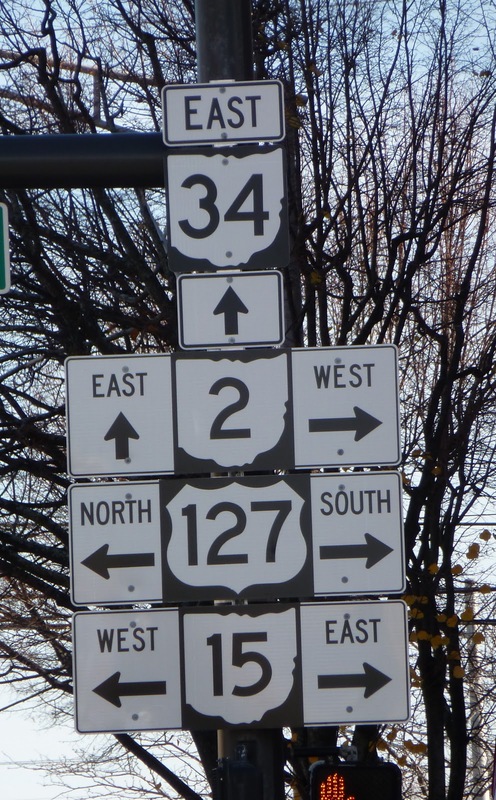 In their wisdom of seeing the whole picture, the Ohio Department of Transportation replaced the road sign recently, striving for consistency throughout the state. State Route 15 is designated in Ohio an east-west route even though you travel north and south here. 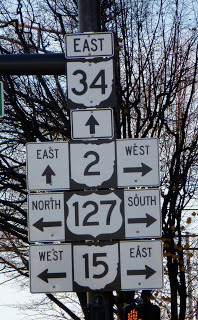 Look at all these signs as a whole – East goes in three different directions. You can travel both south and east at the same time. What a mess. Spiritually, don’t you just want a sign sometime? I have been pondering discernment lately. I know I hear God’s voice clearer in silent times of prayer. I seek the spiritual direction from trusted guides. I search the Bible for better road signs. I journal my options and dig deep into my heart and mind for hints to direct my next step. The road of life we travel is full of detours, construction, and definitely baffling messages. My only clear map is God who sees the whole trip. What helps you hear God better in your decision making?